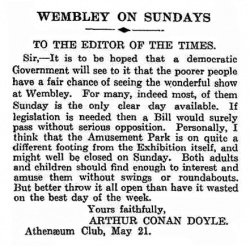 Wembley on Sundays is a letter written by Arthur Conan Doyle first published in The Times on 23 may 1924. Sir, — It is to be hoped that a democratic Government will see to it that the poorer people have a fair chance of seeing the wonderful show at Wembley. For many, indeed most, of them Sunday is the only clear day available. If legislation is needed then a Bill would surely pass without serious opposition. Personally, I think that the Amusement Park is on quite a different footing from the Exhibition itself, and might well be closed on Sunday. Both adults and children should find enough to interest and amuse them without swings or roundabouts. But better throw it all open than have it wasted on the best day of the week. This page was last edited on 23 July 2017, at 00:21.